Hedge Creek Falls is a short and scenic hike located in Dunsmuir, California. After making your way behind the waterfalls, the trail will take you to a lookout point that offers views of the majestic Mt. Shasta. 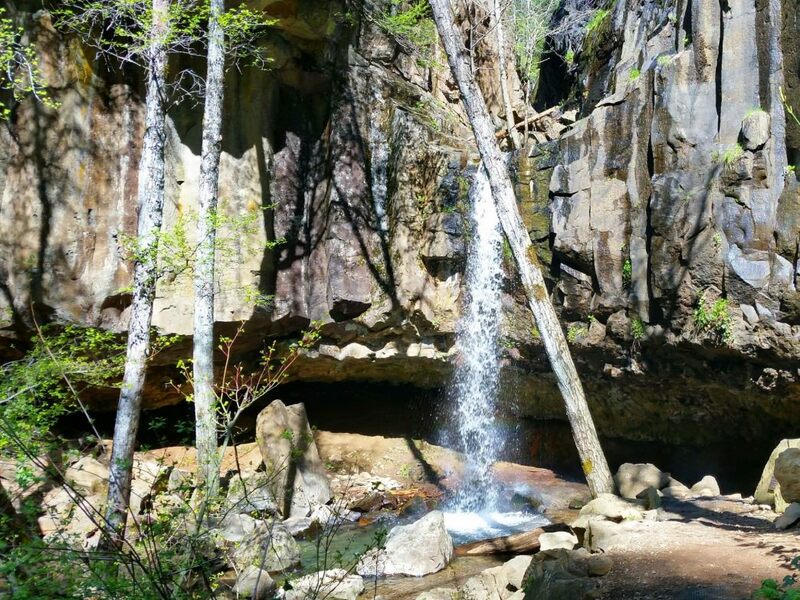 The cave behind Hedge Creek Falls is believed to be the hideout of Black Bart, the notorious stage coach robber. Hedge Creek Falls Trail is a short, scenic hike located in Dunsmuir, California. Featuring a 30-foot waterfall and a lookout offering views of the Sacramento River and Mt. 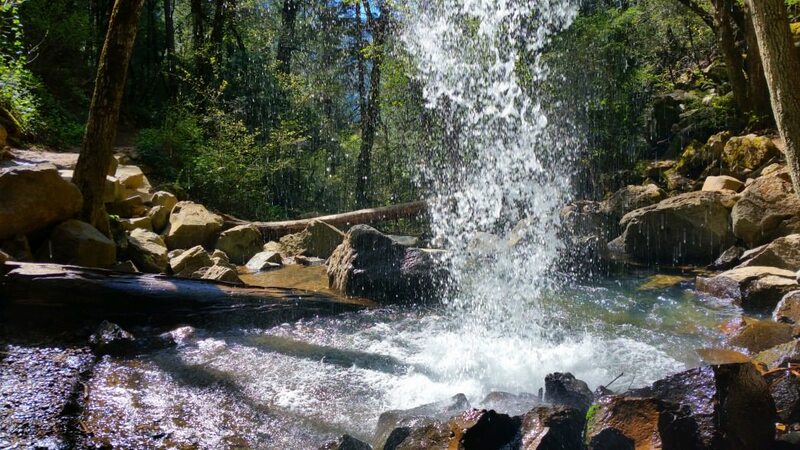 Shasta, Hedge Creek Falls is a must-see in Dunsmuir, California. This is a short and sweet hike with 200 feet elevation gain on your way back up out of the creek bed. The falls are at their fullest in the early spring right after the rainy season. As this destination is crowded in the summertime, early spring is the best time to get great photos. There is a free parking area across the street from the trailhead. 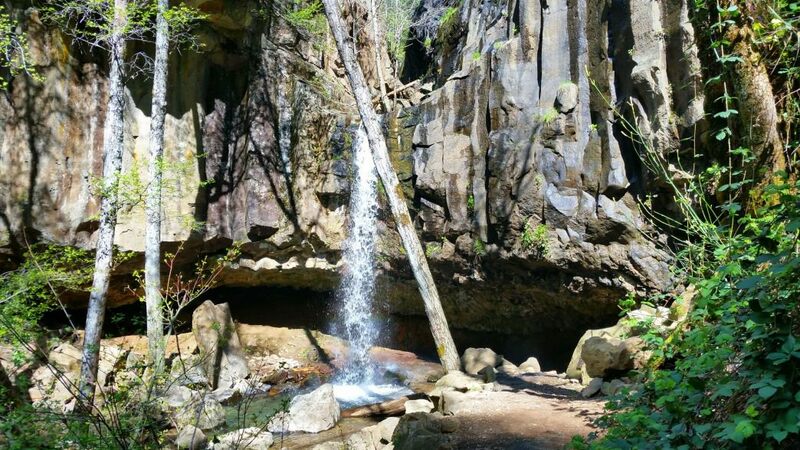 Located in the small town of Dunsmuir in Northern California, Hedge Creek Falls features a 30-foot waterfall and a lookout offering views of the Sacramento River and Mt. Shasta. Despite being one of the smallest waterfalls in the area, Hedge Creek Falls is a popular destination for locals and tourists alike. Hedge Creek Falls was believed to be the hideout of notorious stage coach robber, Black Bart (a.k.a. Charles E. Boles). Hedge Creek Falls also earned the nickname “Million Dollar Waterfall” when it was saved from obsoletion during the re-routing of I-5. 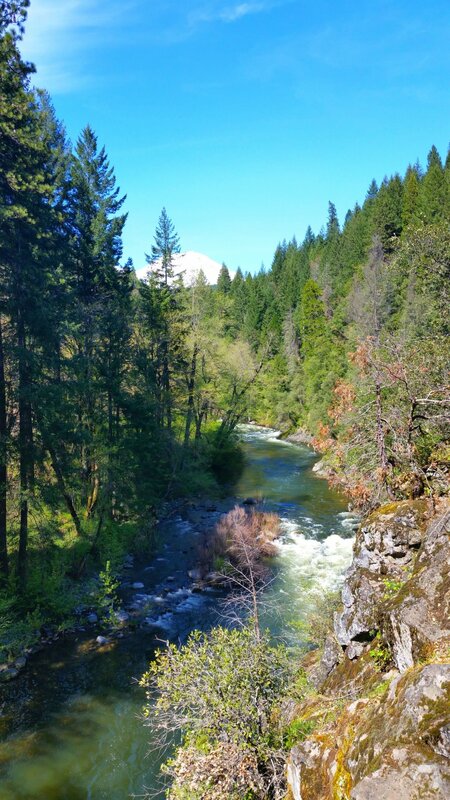 After exploring Hedge Creek Falls, visitors can check out the shops and museums in Dunsmuir’s historic town center or grab a beer at Dunsmuir Brewery Works. Across the street from the parking area is a small, shaded picnic area complete with a table and a water fountain. The beginning of the trail is to the right of the picnic area. The marked path is about four feet wide and level. 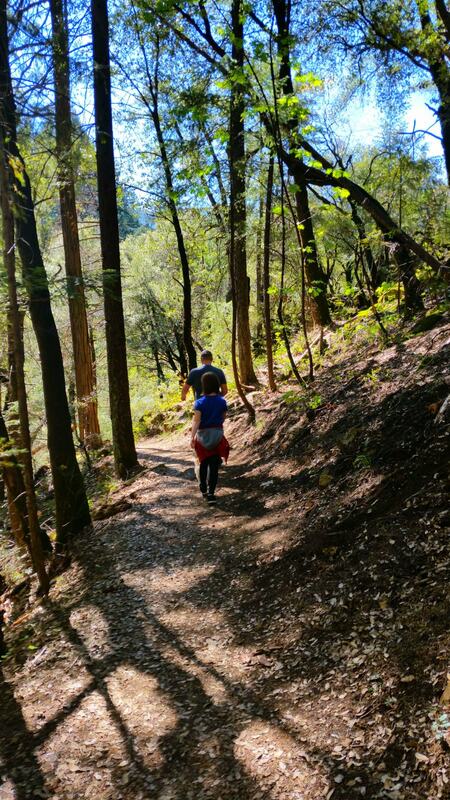 Shaded by lush foliage, hikers will walk along three short switchbacks to make the 200-ft descent to the creek bed. At the bottom, hikers are rewarded with a 30-ft waterfall cascading off a cliff into a pool of water at the base. Using mud, visitors have created a mural of prehistoric-like handprints along the cliff overhang behind the waterfall. There are rocks along the sides perfect for kicking back and taking in the scenery. During the summer, the falls are often packed with people taking pictures and cooling off in the cascades. The trail continues on behind the waterfall (Black Bart’s cave hideout) to the other side of the creek. In about five minutes, hikers will arrive at a small, fenced-in overlook that showcases panoramic views of the Sacramento River and Mt. Shasta. This short and easy hike can be enjoyed by hikers of all calibers. The path is fairly wide and level. 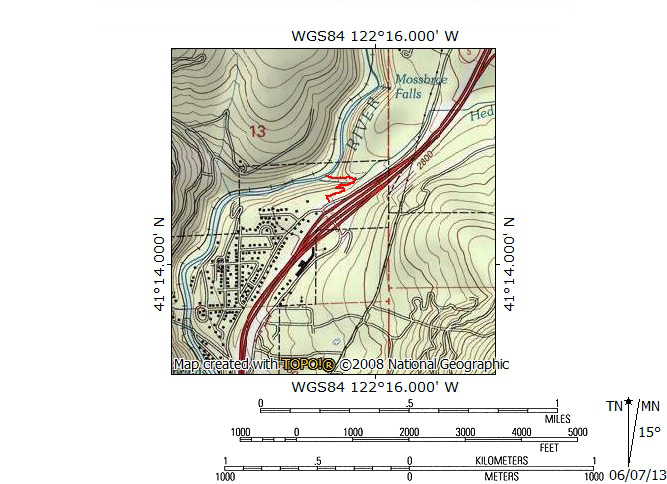 There is a gradual 200-ft elevation gain on the way up out of the creek bed that is easily doable by most. During the rainy season, the section of the trail closest to the falls can be slick and wet, so hikers should watch their footing. From Redding, take I-5 N and drive about 54 miles. Take exit 732 for Siskiyou Ave toward Dunsmuir Ave. Turn left onto Siskiyou Ave. Turn right onto Dunsmuir Ave. Immediately on the right, you will see a large dirt parking area. Across the street, there is a small picnic area with a historic water fountain. The trail head is to the right of that.